Vintage Leaf Memories - Michael Langlois: A quirky Leaf story that Komisarek (and Grabovski) could add to some day: Looking back at three former Maple Leafs who played for all 3 “Original” Canadian teams. A quirky Leaf story that Komisarek (and Grabovski) could add to some day: Looking back at three former Maple Leafs who played for all 3 “Original” Canadian teams. Leaf fans with a sense of the franchise’s history (or those who were around at the time) well know that back in the 1950s and ‘60s—a golden era in many ways for the sport of hockey—there were only six NHL teams. It was only later, of course, when the league expanded to 12 teams in one fell swoop in the fall of 1967 that we began to talk in terms of the so-called “Original Six” franchises. Until then, it was just the way things were. One of the quirks about the Maple Leafs back when I was a youngster in that late ‘50s/early 1960s time period was this: while there were indeed only six teams back then and players did move around somewhat (though nowhere near the constant roster movement that we see today), it was relatively rare that players went directly from the Leafs to the Montreal Canadiens or vice versa. I mean, it did happen that guys did end up playing at some point for both Canadian franchises in that era, but it was, at least as I recall, a relatively infrequent occurrence. Part of the reason for that was the rivalry between the cities and the deep hatred between the hockey organizations. That intense dislike became even stronger when Frank Selke Sr. left the Leafs (I believe he was fired by then Toronto owner Conn Smythe) and took on a similar management role with the Habs. That rivalry- along with the personal distrust between those two men- may well have been the reason why the two organizations rarely made trades with one another. So no, fans in that era didn’t see many guys who played for both rosters, though it did happen. Bert Olmstead, for example, came over from the Habs prior to the 1958-’59 NHL season. Another future Hall-of-Famer, Dickie Moore, joined the Leafs for a season in the mid-1960s after he had “retired” (really, he was pushed into retirement by Montreal management at the time). Both men brought a lot of Montreal’s winning spirit to the Leaf dressing room. But by and large in those days, Leafs were Leafs and Habs were Habs and the 'twain' rarely met. For me, one of the real curiosities of the time that isn’t talked about much was that, when the Vancouver Canucks joined the NHL in time for the 1970-’71 season, one of their players was an individual who had previously played for both "Original Six" Canadian franchises in Montreal and Toronto. His name was Marc Reaume. (I’ve written here about Reaume here before, because he was one of my first Leaf “heroes”. That wasn’t surprising, given that he lived about three miles down the road from me in a small town just outside of Windsor, Ontario.) 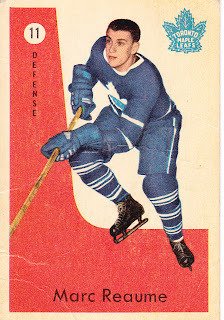 Reaume had been a promising young rearguard with some offensive flair under coach/GM Punch Imlach with the Leafs, but found it impossible to crack the “big four” blueline corps of Horton and Stanley, Baun and Brewer as Imlach was building a really strong squad in the late 1950s. Remember, those were the days when most NHL teams basically used four defensemen—period. Over the years, Imlach successfully employed a number of very useful “5th guys”, including Al Arbour and Kent Douglas, as well as Larry Hillman. All contributed to Leaf Stanley Cup success, but it was a coveted spot—and hard to keep. Reaume (shown at right as a youngster with the Maple Leafs) was dealt to the Red Wings in one of the biggest trades in Imlach’s early tenure as Leaf GM. During the 1959-’60 season, superstar defenseman Red Kelly retired (temporarily) because the Detroit Red Wings tried to trade him to the New York Rangers. He steadfastly refused to report to his new team. Over time, his GM, Jack Adams, worked out a deal with the Leafs. (Toronto’s assistant GM, King Clancy, had been given permission to connect with Kelly, and convinced Red he had a big role in store for him with the Leafs.). Reaume went to Detroit, and Kelly, as we all know, went on to help the Leafs win four Stanley Cups over the next decade, playing all the while as a converted centre. Later in the ‘70s, another former Hab and Maple Leaf, goaltender Cesare Maniago, became the second such player, when he ended up in Vancouver as well. Maniago broke in with the Leafs. While he did not play many games for Toronto as Johnny Bower’s sometimes back-up in the early 1960s, he was involved in a game of historic proportions. He was in net for Toronto at the Montreal Forum the night that “Boom Boom” Geoffrion scored his 50th goal of the season in 1960-’61 for the Montreal Canadiens. (Maniago is shown at the top of this story in one of my favourite old-time hockey photos.) Geoffrion became only the second player in history at the time to have scored 50 goals in a single NHL season. 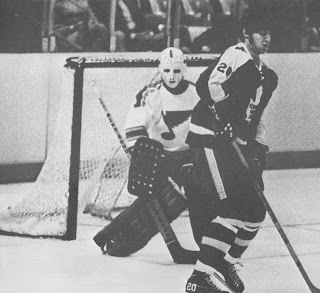 Maniago went on to play with the Habs a bit in the early-mid 60s, before expansion allowed him to make a very big name for himself as a number-one goaltender with the Minnesota North Stars in the late ‘60s and early ‘70s. (He partnered for a while with another goaltending legend, ex-Hab and Ranger, Gump Worsley.) When he joined the Canucks, Maniago became another one of those “trivia” answers. More than that, he was widely respected for his outstanding play and positive community presence in both Minnesota and Vancouver. You may have memories of other guys who, since those golden days, have played for those three “original” Canadian teams, as I like to call them. I refer to them that way, not out of any disregard for the franchises (and loyal fans) in Calgary, Edmonton, Ottawa or Winnipeg, but simply because in my time as a young hockey fan, Vancouver, Toronto and Montreal were the Canadian franchises for me (and lots of other hockey fans). Those are wonderful memories. The Habs have Kaberle and now Colby Armstrong, of course, but the odds are still fairly slim that any of those individuals will join Reaume, Maniago and Monahan- three NHL’ers who achieved a fairly rare Canadian hockey “trifecta”. Cool. Garry's brother Pat taught me high school history. Thanks Leaf in Habland. Garry was a solid player for the Leafs in the early '70s. He had a particularly productive year in 190-'71, playing with Keon and Billy MacMillan.